"If I could do 6 stars out of five it would be appropriate because Remax Vision Hutto goes about and beyond, before, during and after the buying or selling of your property . I have utilized the services for buying and selling my real estate over the years in Hutto, Round Rock, Pflugerville and Port Aransas Texas and have nothing but good things to say"
"I think E. A. 's review (first to review) says it all. I, too, had the pleasure of working with the Rookers to sell my home, and I had a positive experience. They know their industry, have solid contacts withing the corporate world of real estate, and deliver the level of service they promise. 5 Stars!!" "If you read nothing else in this review, read this: The Rookers are great people, and you should consider them for your next real estate sale or purchase! I sold a home in Hutto several years ago and was unfortunately caught-up in the housing bubble and bank mess that we've all come to deal with. Throughout the process, my bank did everything possible to complicate the sale. If Michael Moore (or any other documentary provocateur) had wanted to make a movie demonstrating everything wrong with the government and the banking industry, he need only have profiled my house sale. It would have sparked Congressional investigations. I chose AC and Maureen Rooker (Remax Vision) to sell my house after AC came to my home and sat at my dining room table to go over the necessary documents. There's something to be said for tradition. They immediately dispatched their employee, Marie, to coordinate the necessary documents (I don't know if Marie still works there, but she was a gem, too). AC and Maureen used all of the available tools to garner offers, and after I had accepted one of them, began the laborious process of moving to closing. This is where mortgage companies, inspectors, bank representatives, and even government employees sought to muck-up the entire process... and very nearly did. I can't overstate the level of insanity forced onto us by these outside groups. People said they would do things and missed deadlines. Documents were lost or incorrectly signed. There were times where I was ready to walk away from the house altogether given the sheer volume of problems with these outside agencies. This is where the value of a competent, relentless real estate broker like Remax Vision cannot be understated. Maureen and Marie were on top of these problems like I have never seen before in a hired professional. I was updated weekly (and sometimes daily) as to status on pending issues, and given that I worked an irregular schedule with varying hours, they somehow managed to keep track of when I was working to ensure priority calls requiring my immediate attention were not made when I would be otherwise asleep. At least twice during the laborious process, Maureen had the Remax Vice President personally intervene to get one of the banks or governmental agencies to do their job and deliver required documentation or signatures. And when the deal was literally in its eleventh hour and ready to either close or implode, Maureen got into her car and drove from Hutto directly to Houston to ensure final closing documents were signed by the only regional office that could convey the necessary signatures. Following the closing, I took the time to contact the National Realtors Association, Remax Corporate, the Better Business Bureau, and the Chamber of Commerce to personally commend Remax Vision for its work. This was unsolicited and post-closing, and Remax Vision neither asked me to do this nor compensated me for doing so. I did this because I experienced first-hand the quantitative difference in service from the Rookers and Marie that you simply do not receive anymore. The internet is awash in negativity and complaining (no surprise there), and I think people largely have unrealistic views on what kind of service they should expect when hiring professionals. My experience with Remax Vision is the rare time when the opposite is true, and what I received was far beyond what they were compensated for. In the end, the best thing I can do is refer business to them. So that is the reason for this review. Please consider Remax Vision when making your decision. And if you don't believe me, contact the Hutto Chamber of Commerce and ask if AC and Maureen Rooker have ever received an award or recognition due to a resident's letter commending their service. When a customer goes to that extent to thank a professional service provider, you know you've found someone special. These are good people. You can't say that about most people these days. All these years later, I still have saved on my voicemail the messages that Maureen and Marie left me when the closing documents were finally conveyed. I replay those messages whenever I need to be reminded that there are still good, honest, hardworking people left in this world. Maureen's "voicemail cheer" is still something that puts a smile on my face. Thank you Remax Vision." "Alright!!!! !, AC & Maureen, thanks so very much for all that you both and your staff did in getting our house sold. I believe that had we signed up with you earlier we would have sold faster and realized a better selling price. Your local knowledge is invaluable to those selling in the Hutto area. We wholeheartedly appreciate your going the extra mile to secure this sale. If there is anything we can do for you and your business as it pertains to advertising your good works, please let us know. Again, thank you! And God Bless you both." 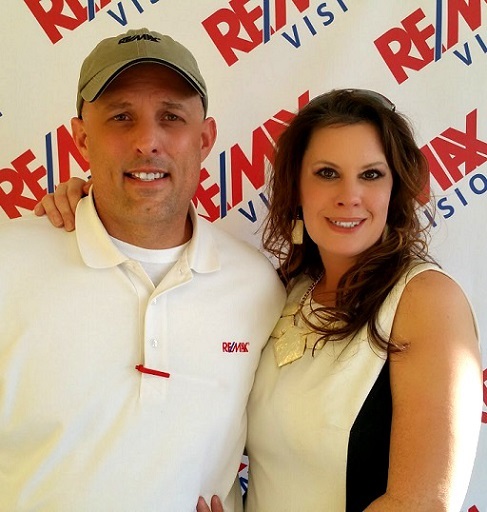 "After looking at and interviewing several real estate agents, we hired the Rookers of Re/Max Vision to sell our house in Taylor. We selected them because they demonstrated that they had a better idea of the Taylor/Hutto market than other real estate agents out of Austin or Georgetown. After selecting the Rookers as our agents, they were very helpful in helping us price and market our home. AC and Maureen were helpful in showing us what we needed to do to get our house ready and staged to sell. One of the key differences that we noticed between our listing and others were the quality photographs. The pictures AC took really showed our home well and we had many showings right away. AC helped us through negotiations when we had offers and we ended up selling our house for more than we had thought we would when looking at comparable houses in our area. We also sold our house more quickly than we thought it would take. We are very happy to have selected the Rookers of Hutto Re/Max Vision and would highly recommend them if you are selling a house in the Hutto or Taylor area especially." "I am writing this letter to express my profound appreciation for the services I received from RE/MAX Vision Hutto from AC and Maureen Rooker and their assistant, Marie Trevino, and Charles El Mousa, COO and General Counsel for RE/MAX Texas. I find it difficult to put adequately into words what a difference they made for me in selling my home.Like many home sellers, I found myself caught-up in the crashing real estate market. They began marketing my home in December 2009 and soon found me a buyer that was using the USDA program to purchase my home. A snarl of red-tape bureaucracy later, and by summer 2010 we were struggling to wade through the government’s endless paperwork to ensure the buyer could qualify to purchase the home.It was during this “mess” that I came to understand the value and need of a licensed RE/MAX agent like the Rookers and Ms. Trevino. Every step of the way, they held my hand, assisted with managing the paperwork nightmare, kept me up-to-date with regular updates." "Maureen successfully sold our home in a short-sale transaction. From negotiating with the bank to solidifying a buyer, Maureen & Marie did what it took to make it happen! The deal WOULD NOT have happened without their extensive knowledge, hard work and dedication."